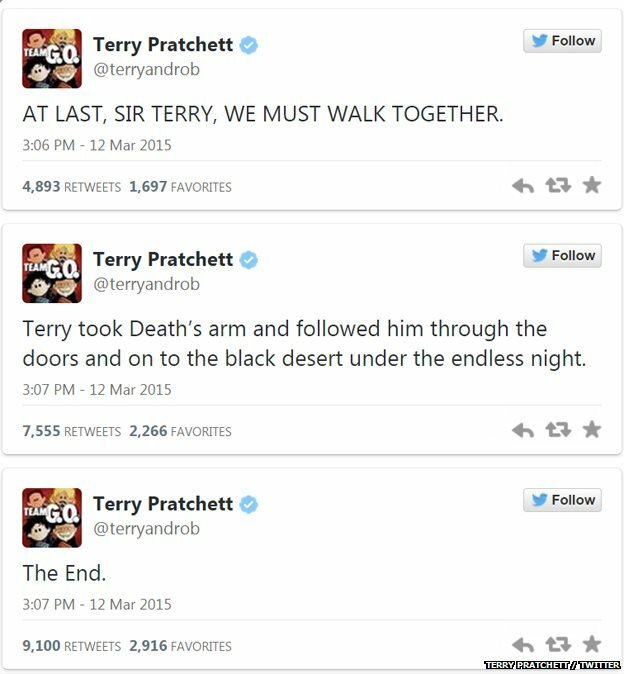 I'm incredibly sad to find out Terry Pratchett, possibly my favorite fantasy author, finally passed away. Went into the endless desert. Left early to avoid the rush. Kicked the bucket. "No one is actually dead until the ripples they cause in the world die away..."
R.I.P Mr. Pratchett. You and your celestial turtle A'tuin shall live in our hearts forever. I'm reading Reaper Man right now, for the first time. It was given to me be a friend, and its my first Pratchett novel. Incredibly odd and bittersweet for him to have died while I was reading this book. Reaper Man was already on its way to becoming one of my favorites prior to the news the other day. We humans love to find significance in odd timing, but this a moment which will stick with me. Terry Pratchett gave a great deal to the world. I feel lucky to benefit from a little of it. This video is very relevant. How do we judge whether a Sci-fi/Fantasy figure is important enough to get an “In Memoriam” meta post?